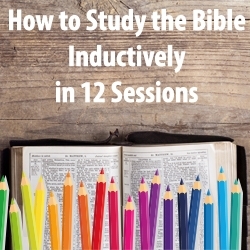 HOW TO STUDY INDUCTIVELY WITH LOGOS - PRACTICAL, TIME SAVING, AND ESSENTIAL! John completed his training at Precept Ministries to lead Precept studies back in 1998. John has led various Precept studies over the years.